We all know the feeling – you sit down to start writing and you’re staring back at a blinking cursor and a completely blank slate. While you may normally hear the term writer’s block, this can easily happen to bloggers too (trust us, we know from personal experience!) When blogger’s block hits you, you may feel like giving up. Don’t quit just yet! Making consistent updates to your blog is very important in order to build a successful blog and traffic. Not only does maintaining your blog keep your reader’s satisfied, it can also help garner more attention from popular search engines like Google, keywords and social media shares. However, its hard to accomplish this when you’re feeling frustrated, uninspired and out of ideas. While a fresh cup of coffee or walk around the block may clear your head in some cases, often what you need is a new source of ideas. Luckily, these can come from many different places. While it’s easy to cycle through the obvious choices for blog ideas, mixing it up can help your blog stand out and keep your clients interested and engaged. In today’s post, we’ve gathered some of our most useful tips for the next time you’re drawing a blank. As paying customers, your clients are invested in your company too so use your blog as a chance to delve deeper into any major company changes or updates. This can be a great chance to let current and future clients know about new services you’re offering, staff changes, office moves, etc. Anything major happening within your firm will be of interest to your clients, so don’t hesitate to share it! Twenty Over Ten’s “Meet the Team” blog series gives visitors a peek into the team behind our company. Here at Twenty Over Ten our “Meet the Team” posts highlight a different employee every week. Clients like to get to know the people they’re working with, especially their financial advisors. Blog posts like this can be a fun way to accomplish just that. You can write about a mix of career and personal information, and include some pictures to showcase your awesome team. Some good questions to ask might be “Where do you see yourself in 10 years?” “Who is your biggest inspiration?” or “If you could travel anywhere in the world, where would you go an why?” These kinds of posts help show off your firm’s personality, which lets clients establish a deeper understanding of your brand. 2. What do your clients want to hear about? Your clients are the main reason you’re blogging, so make sure they get some say in what you’re writing about. Make a list of topics that commonly come up when you’re meeting with your clients. Are a lot of people asking about how to properly save for retirement or paying down student loans? Write these down and use them as blog post topics when you’ve hit bloggers block. Your clients are sure to take notice and appreciate the thought leadership and insight! It also allows you to prove yourself as a credible resource for current and potential clients when they visit your website. 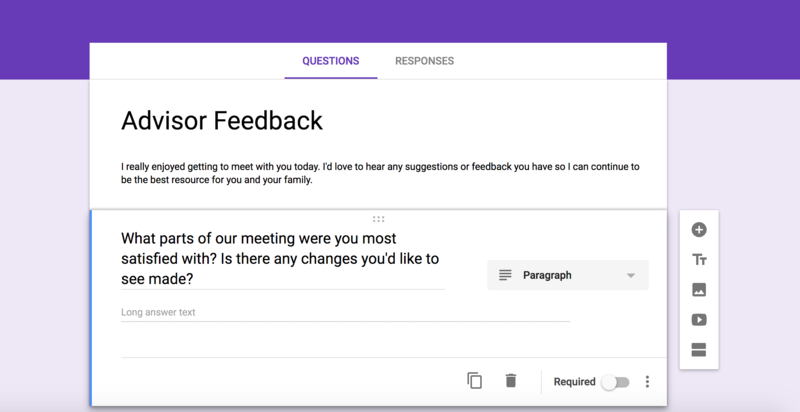 You can use Google Forms as a free method to survey clients on their interests, concerns, and more. Consider creating an email survey or social media poll asking for topics clients would be interested in hearing more about. Not only will it give you ideas, your clients will love to be heard. It gives them an opportunity to interact with your blog and company, keeping them more satisfied with your customer service. Hearing this feedback can also be helpful for you as an advisor. It may show you areas that may need more focus when you meet with clients and give you an idea of what they’re looking to get out of talking with you. If you need some easy survey creation tools, you may want to try Survey Monkey or Google Forms. What’s your best friend when it comes to SEO? Keywords, of course! Google Alerts, Google Trends and UberSuggest can all be helpful tools when it comes to finding the right keywords to focus your blog on. Not only does this ensure you’re talking about subjects people are interested in, it also helps people find your blog more easily. Trending words are ones that a lot of people are searching for, so your page will be high on Google’s list if you’re using them regularly. 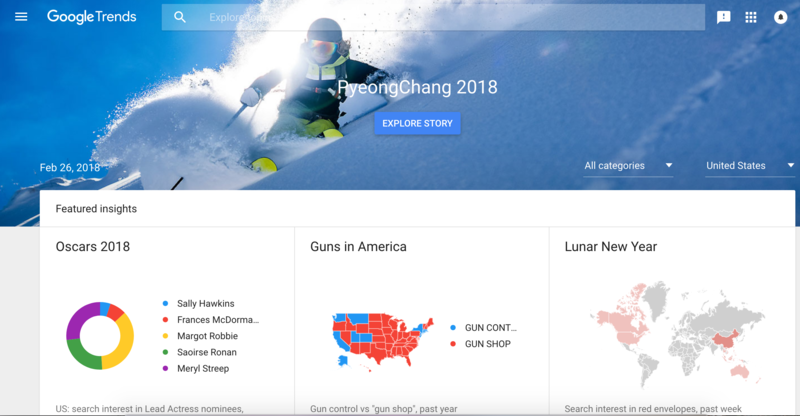 Google Trends tool shows leading topics and stories that may make good blog ideas. Checking these sources also helps keep you up to date on any changes you should be aware of. If there’s a big shift in the industry, you’ll want to be the first one to tell your clients about it. People are always interested in big news stories, so don’t let your blog fall behind. Its okay to step outside your comfort zone every once in while. As an advisor, it’s important to show your personality to clients and prospects. They want to see that you’re a real human. Consider posting blogs about your hobbies outside of work, your community involvement or something locally that might be of interest to those visiting your blog. It’s okay if it doesn’t directly tie back to your industry or business. It’ll be a good break from your usual posts. This is especially useful if you work with clients in a specific geographic area. If your favorite local team wins a big game, you volunteer for a great organization or have a huge milestone in your personal life, feel free to share it with your clients. As an advisor, you know a lot of personal information about them- now its your turn to share! Getting to know you better can help clients feel more connected to you and your business. Guests posts are an awesome way to partner up with other leaders in the industry. When you do a guest post, you’re creating a great opportunity for both you and the author you’re featuring. Maybe it’s a partner who specializes in something different than you, recently won an award or just wrote a piece you really liked. Featuring a guest author allows you to give your clients information from a new perspective and helps you make great connections in the industry. The Twenty Over Ten blog features a guest post from Flackable, a leader in public relations for financial advisors. This also shows clients that you’re a great resource for them in more than one way. Being able to direct them to multiple credible sources tells them that, even if you don’t have the answer yourself, you can still help them out. Another way to utilize guest articles that is helpful for your clients is to release a weekly or bi-weekly collection of articles you read recently and found interesting. These can range from retirement tips to business advice, depending on your target audience. Our weekly Five Little Things blog posts are an example of this. In addition to giving you good blog content, these provide your clients with even more great resources for any questions they may have. If you need a little more guidance on guest posts, check the recording of our latest webinar, How to Get 100+ More Blog Views. Your previous blog posts make a great source of ideas for future topics. Looking back through them can spark your memory of ideas you may have forgotten about. You can also see if there’s any topics you’d like to expand on further or create a spin-off post of. For example, if you did a blog with 5 key points, create another post going into detail on the most important or complex one. Or, if there has been any updates or changes to areas within the industry that you’ve previously written about, consider making a post pointing these out for your clients. Something else we love doing is creating roundups of our most popular blog posts of the season or all of our posts on one particular topic. This puts them together as a more easily accessible resource for your clients. Roundups also give your readers a chance to take another look at a post they may have liked or remind them of a topic they may have forgotten about. 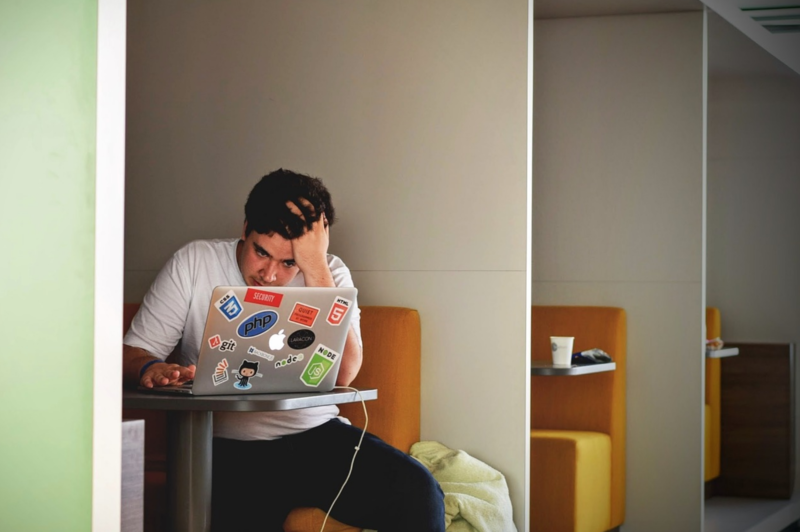 Hopefully you aren’t struck by blogger’s block too often, but if you are, we hope these tips get those creative juices flowing! If you find yourself constantly at a loss for ideas or without the time to innovate, check out Content Assist, our new product for bloggers like you! Our Content Assist service is now included for NO additional charge in ALL of our website packages. With Content Assist, you’ll be well on your way to posting lively, engaging and search-engine optimized content that your site visitors will love.